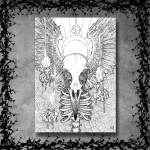 I have to admit to being somewhat a bit of a fanboy when it comes to the dark ambient works of Desiderii Marginis; I rate him highly on the lists of artists amongst the genre. Timing is the key element to creating a good album of this nature and Johan Levin is a master of this; ‘Come Ruin and Rapture’ rolling ever so slowly off the marks as a residual hum, with horn like drones rising through the mists of sound. This method really comes to light on ‘Land of Strangers’, which is utter genius in its composition. Imagine a bleak landscape of natural sound where you look out across a valley where the cloud sits low, in the distance you can hear pipes playing. The range and distance of the music far away in the background, is the fundamental element Levin utilises as his main ingredient here and the effect is utterly haunting; indeed, this is the core brilliance to the main production of this album as whole, as with his other outstanding pieces of work before this. ‘Silent Messenger’ rises through the fog into something nothing short of spine tingling, whilst ‘Adrift’ once again pulls on the medium of letting the main body of musicianship approach you from behind; this is utterly awe inspiring and best played loud on your own in quiet surroundings, quite possibly on your headphones sat on a desolate hillside on the edge of winter. The last song and the title track, is a slow thumping heartbeat with breathing ambient and spacious and harmonious medieval cello work; this is a fitting end to yet another wonderful album and I cannot recommend this release enough. Solidly packaged in an eight-panel digipak we have Beyond Sensory Experience’s seventh album on their tenth anniversary; it’s a fitting package for an act that has managed to make a decade and long may they continue. ‘Through the Underworld’ opens up this latest instalment and is an electronic journey through, well… I guess, the underworld. Thumping heartbeat like rhythms give the impression you are sat along for the ride and things are only going to get darker from here on in. BSE have always made sure their music mirrors the name of their project; from hellish screams that bluntly stop and flow into distant piano, to rolling thunderous crashing ambient and natural atmospherics, they literally assault the senses from all angles once again. ‘Modern Day Diabolists’ as a whole follows no particular route to make its statement and the title track itself is a mash of surging blackness that sounds like it was conceived in the darkest pits of hades. Sporadic throughout as an album, there are many interesting elements tampered with here and surprisingly sparse too in an older electronically industrial approach, as explored on tracks such as ‘Geometric Fashion’. The accompanying DVD starts with a more than competent visualisation of the aforementioned ‘Geometric Fashion’, highlighting the electronic nature of the track, alongside wire like visuals and effects that are edited precisely in time with the warm machine head beats. ‘Rapt From Earthly Things’ has a more minimalistic approach, displaying two windows that flow alongside the reverberated piano and radio wave like vocals. It’s an understated affair and the medium in which the visualisations have been captured, work well conceptually with a degree of true understanding of the nature of the track itself. As an album on it’s own, ‘Modern Day Diabolists’ is one of those releases that normally would take a couple of listens to bed in; however I would recommend you head to the DVD element of this package first, as this is where the release really comes alive. From there on in the album itself will immediately have more of an impact. Bulgaria’s Shrine open up the proceedings with the sound of waves splashing against rocks upon a shore with a hypnotic chime played over drifting pads; in the background you hear gulls occasionally screech and possibly the sound of children playing, unless my ears deceive me. It’s a pleasant enough start to ‘Somnia’, if maybe a little too long considering its slight lack of variation overall. ‘Immersion’ breaks away from the stagnation that started to creep in on track one; rising pad upon soaring synth slowly ascend through a dense ocean of rich warm ambient and gently break through the tide towards the end of the track. This in turn flows well into ‘Lost Beauty’, with subtle acoustic elements that bring to light a slow paddle to the shores of a distant cove. There is a natural aquatic nature to this album that brings to light the works on Spectre’s sub-label Nautilus, who based all their releases around the medium of water. Indeed ‘Somnia’ could easily be slotted in amongst the whole output from that label, considering the style of ambient on offer and should be hunted out by those that have dug deep into their pockets for such work previously. All in all, this release is a competent and solid, if not generic album from start to finish; surprisingly oppressive considering the light synth work, the very nature of feeling like you are forever sinking under the water does make you feel like you are perpetually drowning, whist ambient waves suffocate and smother and as the CD sub-title states: ‘low level lucid dreams’; indeed. It’s been approximately four years since Peter Bjärgö’s Arcana had a new release with ‘Raspail’ and here we have the prelude to the forthcoming full-length, ‘As Bright as a Thousand Suns’. Opening with ‘As the End Draws Near’, we are once again treated to arcane acoustics and warm melancholic male vocals, gently harmonised with subtle female touches and background operatic wails. The mix is perfectly blended and as epic as all the past works of this project, drifting and gliding, effortlessly medieval. ‘A Cage’ follows suit, with chiming, glorious, mesmerising hall filling chants and an almost Gothic masquerade of sound that to the uninitiated will be reminiscent of Dead Can Dance, while long term fans will be pleasurably satiated. The finale of this short introductory return, ‘A Precious Stone’, is a glorious female vocal driven ballet of sound soaring across cold, cracked flagstones, wandering blissfully between the pillars of a distant ruin on a cold winters day. 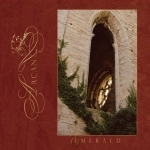 ‘Emerald’ feels remarkably short; yes this is an EP and the songs themselves are not in themselves devoid of length, it’s just so thoroughly engaging that it more than whets the appetite as a stop-gap for the future full length album. Taking its name from the painting by Gustav Moreau of Salome’s vision depicting the apparition of lokanaan, we have 7 tracks of cold ambience created with a range of almost purely organic sounds and air like frequencies. Amanda Votta, the force behind this project, has once again relied heavily on the flute as her weapon of choice. Throughout the album this medium leads the way and is at the forefront of most of the tracks, floating over pockets of frost like whispers and gasps of air whilst a bass driven hum rumbles onwards as the soil beneath the low level fog. Being a massive fan of dark ambient music, this should in theory be right up my street and indeed in a lot of respects it is. Consumed as a whole however, I found ‘The Apparition’ wanting for atmosphere, desperately seeking something to feel involved in. Whilst professionally put together, the album is best broken down into individual tracks where your attention can be maximised to the full; I have only heard this project in the past on compilations and haven’t been exposed to a full individual release, where in one sitting it simply needs more than the sum of its parts. Solid as this is in it’s individual construction, there is nothing that makes you jump out of your seat with excitement; do not let this put you off listening though, as this is probably best consumed as stop gaps between other artists of the same ilk. Talent is firmly hidden away in the heart of this project, even if you have to stretch the boundaries of patience to uncover it. The concept of sounds experienced in space is a subject that has been covered before by many a dark ambient artist, from Inade, right through to Sleep Research Facility, all with moderate success. Now it’s the turn of Gustaf Hildebrand, who takes us on a journey to the ‘Heliopause’; a point in space outside our solar system, where the solar wind ceases to exist and the Sun becomes a pinprick of light. Imagine if you will, that you are stranded in such an area and you only have a radio receiver for company; what would you hear? Of course, this is only guesswork, but it does leave food for thought and Hildebrand is obviously adventurous enough to explore the possibilities. Either way, as a concept for an album it makes for an interesting train of thought and a perfect backdrop to a pitch-black ambient album. As you can imagine, radio sounds of many a variety crunch through the static, echoing and reverberating, riding on guttural drones and moderate sparks of power electronics. The Hum of thundering, bass driven ambience is deeply rewarding above all else and it is this that carries the album along where it could fall short, as the essential glue to the consistency throughout. 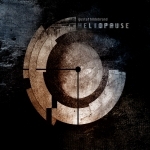 ‘Heliopause’ is definitely one for the aficionados out there and would most likely be lost on the casual observer; it does take time to bed in, but will be more than rewarding for followers of the genre and subject matter, if not reaching the peaks thematically of those who have delved into similar subjects in the past.